Build the capacity of teachers to equitably implement student-centered instructional strategies. Address gaps in curriculum in ways that foster creativity, address the local culture, scaffold achievement for diverse learners and increase motivation for teachers. Design formative and interim assessments that promote a new vision for 21st Century teaching and learning and target support for those that need interventions. Leverage technology to promote deeper and more personalized learning. Structure implementation activities in ways that reach every teacher, every classroom and every student. Engage and motivate site administrators, teachers and family and community members. 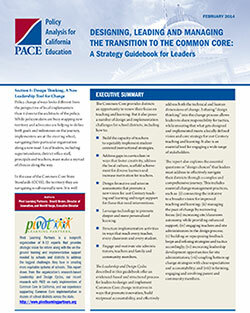 The Leadership and Design Cycles described in this guidebook offer an evidenced-based and structured process for leaders to design and implement Common Core change initiatives in ways that promote innovation, build reciprocal accountability, and effectively address both the technical and human dimensions of change. Infusing “design thinking” into the change process allows leaders to share responsibility for tactics, while ensuring that what gets designed and implemented meets a locally defined vision and core strategy for 21st Century teaching and learning. It also is an essential tool for engaging a wide range of stakeholders. The report also explores the essential questions or “design choices” that leaders must address to effectively navigate their districts through a complex and comprehensive journey. This includes essential change management practices, such as: (i) connecting the initiative to a broader vision for improved teaching and learning; (ii) managing the pace of change by narrowing focus; (iii) increasing site/classroom autonomy, while providing enhanced support; (iv) engaging teachers and site administrators in the design process; (v) building or repurposing feedback loops and refining strategies and tactics accordingly; (vi) increasing leadership development opportunities for site administrators; (vii) coupling bottom up change strategies with clear expectations and accountability; and (viii) informing, engaging and involving parent and community members.